Grace brought a sea of pink into our home when she arrived in April of 2006. She is the only girl in a houseful of boys. She is my girly girl! 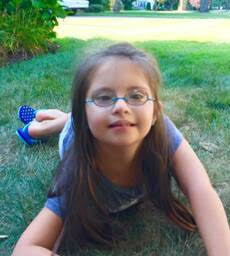 Grace loves dancing in front of her mirror, looking at books and playing with her brothers. She does her best to keep up with them. They love her and don't treat her any different because she is a girl. She gets teased, tackled and run over. She loves going to school and vacations at Myrtle Beach. Signing Time videos are her favorite. She can spell her name although not yet write it, "G-R-A-C-E spells Grace!" 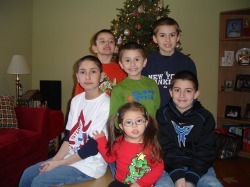 Our family is like any other family with six kids...except Grace happens to have Down syndrome. Down syndrome, scary words when attached next to your child's name. Yes, my early days with Grace were filled with fear and uncertainty. There were months of sadness as we did our best to understand what this meant for our family. But the sadness slowly lifted as we discovered what a blessing we truly did receive. When Grace was 2 1/2 months old she had open heart surgery to correct a whole in her heart. I will never forget the joy my husband and I felt as we walked into the recovery room and Grace was alright. I knew we would all be alright. Grace is now 10 years old and is in fourth grade. She loves reading books and having camp outs in her brothers’ room. Her favorite books are the Ramona books. We read them together at night. This spring she was part of a baseball team for kids of different abilities. Although she preferred batting to playing the outfield, she had a blast! She also earned her Sparky Award for completing 3 years in AWANA Sparks. During her 3 years in Sparks she memorized 150 Bible verses! She was a Junior Girl Scout and the highlight of the year was spending the night at the Boston Science Museum! She is s joy to our family! We are thankful for all the friends we have made thru 21 Strong! !